In the midst of an ongoing public dispute with Brannon Howse (host of Worldview Weekend Radio), I have really struggled with whether or not to say anything public past the one post I initially wrote (An Open Letter To Brannon Howse). I wrote that post in order to address our conflict and to correct some misstatements and mischaracterizations that Brannon has made about me personally. However, in the face of the relentless Facebook postings, comments, articles and radio shows by both Brannon Howse and Chris Pinto, I feel I must once again speak up. I know that God is my Judge and my Vindicator, and beyond that, what can man do to me? (Hebrews 13:6) And that God also says, "Vengeance is mine, I will repay," (Romans 12:19) but this is not about vengeance, and I do think biblically it's acceptable, and even good, to speak up when false witness has been borne against you by a brother or sister in Christ. So that is what I'm doing. So. In the middle of this dispute, it was brought to my attention that Brannon had mischaracterized statements made in an interview by respected author and Bible teacher Susan Heck, who is a wonderful Bible teacher and whom I know slightly from women's conferences at my church where she has taught. 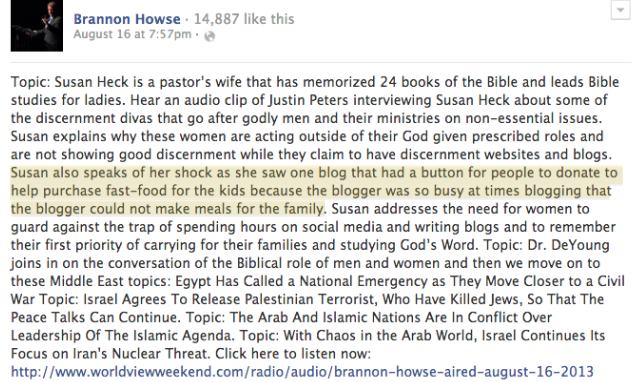 In the interest of keeping this as simplified as possible, I am creating a brief timeline that documents this mischaracterization of Mrs. Heck's comments by Brannon Howse. Justin Peters: Well, Susan I want to just follow up a little bit on something in the last program, which is, kind of in broad terms, what the Bible has to say about the role of women. And we discussed our men and women are of equal value before God, no argument there, we are of equal value, and in Christ there's neither male nor female, Jew nor Gentile, we are all of equal value. But we do have different roles. And following up with our discussion about the role of women, both in the church but specifically what about the public forum? What does the Bible have to say about women who confront teachers, even if they're criticism is valid? Is that the role of a woman to confront in a public forum of a teacher, a male teacher, who also has a public ministry, and who they feel, rightly or wrongly, is teaching some errant doctrine? And we're not talking about Benny Hinn or people who are way, way out there, but people we would consider to be in the fold, if you will. Justin Peters: I think there's a danger, whether it's a blog or whether it's Facebook or these social media outlets, that that can become enormously time consuming, whether you're male or female. And we've talked to people, and know of people, who spend hours every day getting into arguments on Facebook, and all this kind of stuff. And again, I don't know a lot about that from first hand experience, but I think that could be one of the trappings of the “Information Age,” if you will. And there's so many things that distract us away from the time that we need to spend with our families and in the Word of God. Susan Heck: My concern, Justin, is that I know women personally who can sometimes spend two to four hours a day, and yet when I see their homes, they're not clean, their children are not being taken care of. I've been in restaurants where women have actually physically pushed away a child, and said, don't bother me, I'm trying to-- , you know, they're looking on their Facebook or whatever on the phone, and that is very distressing to me. That is very distressing to me. Especially as Christian women, we have a high calling before God to rear our children to the glory of God, and to parent our children. And so, I personally am puzzled why women today are even having children, if they're not gong to care for them and parent them. And you know, they put them in a daycare or they push them aside while they're doing their internet surfing, and my question would be, to some of these women, are they spending as much time in God's Word as they are searching for these type of things on the internet and studying these? You know, they tell us the way we can identify a false dollar bill is not to study the false dollar bill but to study the genuine. And so my question is, how much time are they spending studying God's Word, which is true and sufficient and is going to give us everything we need? And so I think some of these things can be trappings of the Evil One to get us sidetracked from sitting at the feet of Christ, and learning from Him and his Word. That's my two cents, I'll get in trouble. 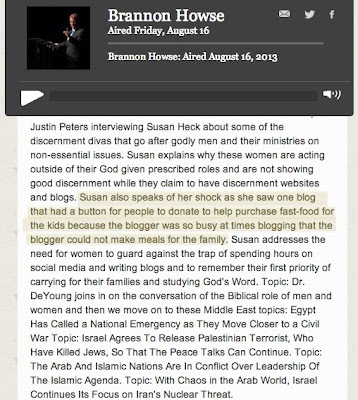 But my friends, if you go back and very carefully listen to (or read) what Mrs. Heck actually said in her interview with Justin Peters, she did NOT say that she was shocked to see a blog with a donate button asking for people to "help purchase fast-food for the kids because the blogger was so busy at times blogging that the blogger could not make meals for the family." She did not say it, folks. And yet Brannon insists that she did. Now let's go and look at a button on the Sola Sisters website that Brannon might have had in mind when he tried to make it appear that Mrs. Heck said she was so shocked over a donate button asking for fast-food money (which again, friends, she never said). Now, I'm not saying Brannon was trying to connect these two things, but let's just look at evidence and see where it leads. This is a button that appears on the sidebar of the Sola Sisters website. Let me just explain that when my husband and I put up the Sola Sisters website, he said to me, you know, addressing false teaching is really sober and serious stuff, and I'm going to be silly with that donate button for the sake of interjecting a note of lightness. After all, people should know you're not a one-note person. So there the button stands. Yes, perhaps in hindsight, it wasn't the wisest thing to put up there, but you know, we're not perfect. And are we right now rethinking the wisdom of this button? Umm, yes! 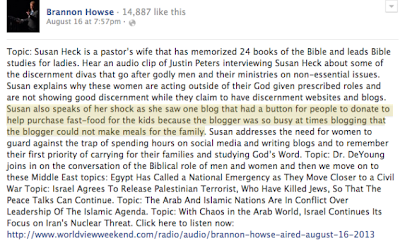 But back to Brannon Howse mischaracterizing what Susan Heck said. In my opinion, because of how Brannon framed his remarks, and reiterated them several times in several places, many people assumed that Susan Heck had in fact made this statement that she never, in fact, made. In closing, let me state that I recognize that there are a lot of moving parts to this drama, and I'm sorry for the complexity of it, but I think for those willing to take a breath, and stop and ponder, and then take the time to examine the evidence, they will see that I am not a gossiper or slanderer or tale-bearer or murmurer or tattler or an embarrassment to the Lord (all charges which have been made by Brannon over the course of the last week, though I may have missed a few). If anything, I am being gossiped against, slandered and have had false witness borne against me. And I do have a biblical right to correct misstatements and mischaracterizations being made about me. In the end, this is not about Team Brannon or Team Sola Sisters......it is about truth, and don't we think that truth matters to God? ✷ NOTE: We may agree or disagree with Mrs. Heck on whether or not women may publicly contend on spiritual matters, but that is something of a separate issue. And please understand by my saying this that in no way do I consider differing views on this to be an issue of separation or breaking fellowship. I'm simply saying that brothers and sisters in Christ can land on different sides of this issue and not be in sin. This is an issue that Godly and very solidly biblical men and women have just come down on differently over the centuries. It is true from Scripture that women are not to exegete (teach) Scripture to men. However, I (and many others) think that the idea that women cannot speak publicly at all, in any way, about spiritual matters is an idea that is not clearly taught in Scripture, and is more of cultural construct that has taken hold in the church than actual biblical truth (particularly in the Southern Baptist realm). Jude 1:3 says "Dear friends, although I was very eager to write to you about the salvation we share, I felt compelled to write and urge you to contend for the faith that was once for all entrusted to God's holy people." So I (and many others) understand the Jude passage to mean that all Christians can, and should, contend on spiritual matters. Now, are there other constraints that we must follow in this endeavor? Yes: a woman must not teach a man (exegete Scripture to him), we must be kind, gracious, above reproach, gentle, loving, etc.........but contend we must. And so there are disagreements over this. But again, that's a separate issue from the fact that Mrs. Heck's statements were mischaracterized by Brannon in his Friday, August 16 radio show.